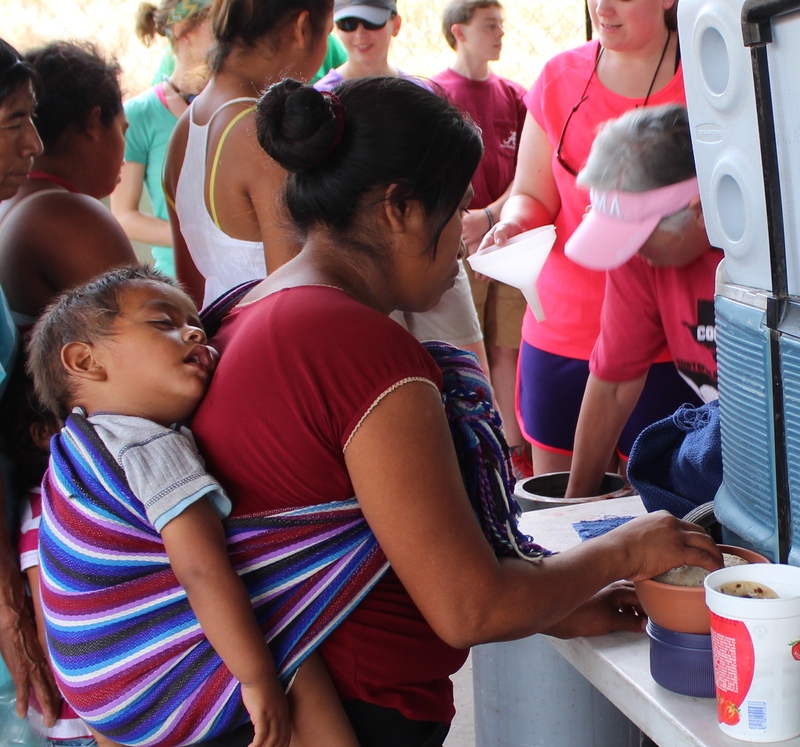 This is the third part of a blog series that introduces you to the men, women, and children we met while serving the LORD in Zacapa, Guatemala. It is what it is … a place where the trash from the community is dumped and burned. And sadly, people live here. They run behind the trash trucks as rubbish is brought to the dump. They dig through the discarded items and find treasures. Aluminum is a high-money item. Also, they collect cardboard, glass, plastics, and metals. Adults as well as many children “work” the dump. We arrive a bit late and the people are lined up waiting for us. We will serve them a mix of rice mixed with meat and vegetables, tortillas, and vitamin-enriched rice milk. 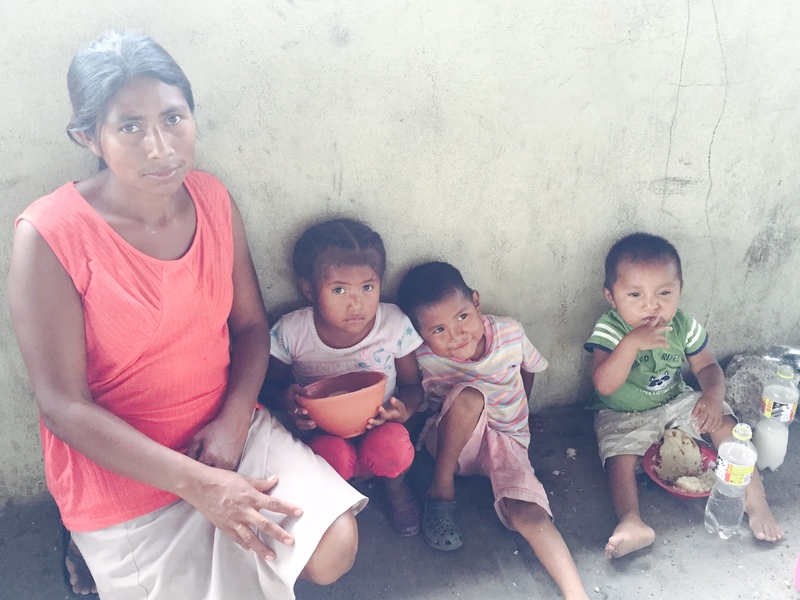 The Hope of Life ministry works to insure these people receive a daily meal. We are honored to serve the people today! Young children, three and four-year-olds, are standing in line with older siblings. Moms are holding babies and toddlers as they patiently wait. In their hands they all hold plastic bowls and empty pl astic bottles … treasures from the dump. These are their “plates” and their “cups” for their meal! The 2-liter cola bottles that Americans throw away daily are guarded as they wait to fill them with the rice milk. We take our place dipping the rice, sharing the soft tortillas, and pouring the milk into their bottles using a funnel. Again, they wait patiently as we serve them. As soon as they receive their food and drink, they go to a section of the open-air pavilion and they begin to eat … with their dirty hands! The young ones lift the 2-liter drink bottles as if they were sucking a bottle! The toddlers feed themselves sitting on the dirty cement floor. Dogs are nearby scavenging for the leftovers. We mingle with the moms and children. They are just like all the other children we’ve met. They smile. They share their toys with us. George (2-years old) is being watched by his brother Daniel (5-years old). I come near and begin to talk to him and see that he has a treasury of toys; all have been scavenged from the dump and all are broken! George reaches toward me and shares his toys. These toys have been in his mouth, and immediately I ask God to strengthen me with His love for these children. I accept the toys and in my hand I’m feeling the wet slobber of this child who lives in the dump! My mind is saying, “Be careful. Wash your hands. Where’s the hand sanitizer?” while my heart is saying, “This little one is precious to JESUS. I must love like JESUS!” I hug him and he reaches for me. I take him into my arms and play with this little child of the King. His brother comes to me. His sister comes to play. My heart is instantly in love with this family! Soon George’s mother comes with the food and the boys turn their focus to eating. They chug the milk and eagerly dig into the rice. They are thirsty! They are hungry! Mom feeds the children and waits to eat, ensuring that the children are fed. We talk through an interpreter, and she says her daughter has a sponsor but the two boys do not. She asks if we can find sponsors for her two boys. We take pictures. We alert the Hope of Life leaders that this mom has requested assistance. We hug! Our hearts are bound with this mom as she does what we do – She’s trying to get the best life possible for her children. She advocates for them. She’s a good mom! Across the room there is Francisca, a four-year-old with dark hair and a beautiful light blue eye. She smiles as Lindsay tickles and plays with her. Many of the children are alone as they stand in line and as they eat their food. When we look at the children with our physical eyes, we see clothes and skin caked with dirt, faces that carry the remains of the rice and milk that has just been consumed, and matted unwashed hair. But, when we look at the same boys and girls with our God-given spiritual eyes, we see a joyous twinkle in their eyes. We see compassion as older siblings feed the younger ones. We see such beauty! And we are changed. Oh Father, Let me see people as you see them. Allow me to have spiritual eyes to look beyond the physical. Let me have spiritual ears to hear the hearts of the people around me. Allow me to be your hands to people who need a comforting touch, and allow me to be your feet to go to those who need encouragement. Use me, LORD, not just in Guatemala. Use me in Gardendale, Alabama. Allow me to BE YOUR LOVE here at home. What a beautiful story! Thank you!!! !